Even though I am the publisher at Alanna Books, it is a very tiny and particular list so I also write for other publishers (see books). In addition, because of my experience in developing publishing concepts (and background in child development), I am often asked to develop bespoke projects for publishers (and I sometimes approach them with projects which I think are a fit for their lists). • sometimes publishers need a project or a text for an illustrator who’s already been signed. this for early years projects. Please see below for bespoke projects which have been completed and published. This series was produced exclusively for Ragged Bears Publishing who have UK rights. Koala Books, Scholastic Australia have Australian rights. All other rights are available. Comparing notes with Margaret Bateson-Hill one day, she told me that, during story times, she asked children where they thought the little ducks from the Five Little Ducks rhyme went. I thought this was an excellent idea for a book and encouraged her to write it. 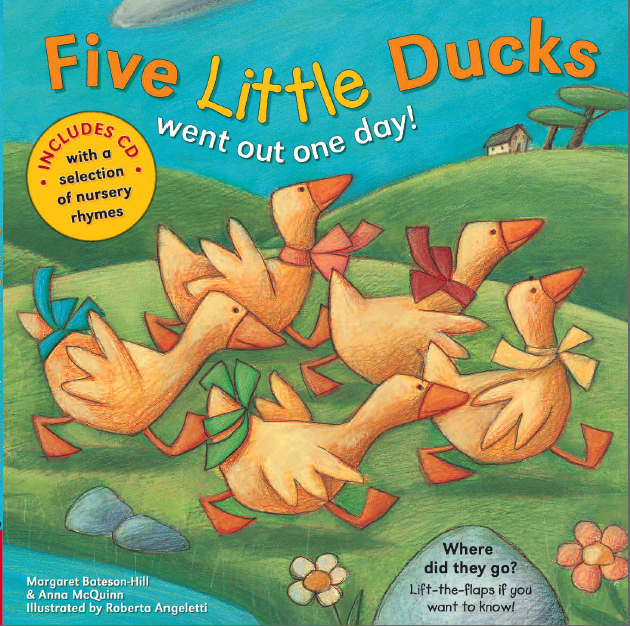 Once I had Margaret’s wonderful text in my hands I worked with it and devised the flaps - so that we find the missing ducks each time underneath. We both know how much children love looking under flaps for things and this seemed the perfect way to present this new take on the familiar rhyme. Margaret and I are both big fans of Ragged Bears' Peek-a Moo books, with their large flaps. I approached RBP with our rough dummies. They immediately saw that the project was a good fit, and asked if I would package the entire project. I found a wonderful artist whom they approved then the whole project took off. Happily, it's been a very successful project for them and soon needed reprinting. we used this opportunity to add a CD. 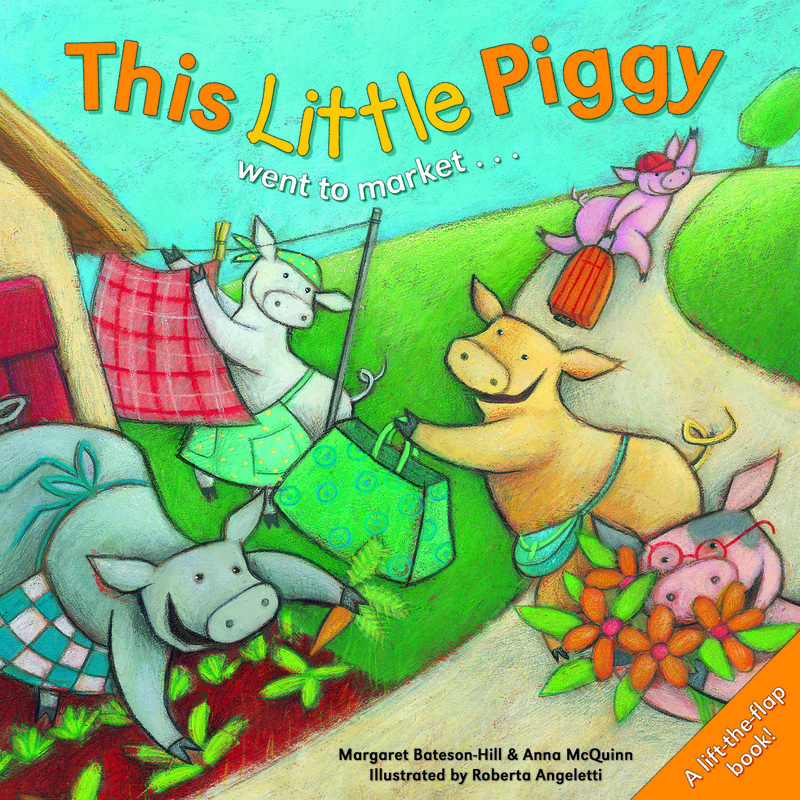 RBP quickly came back to us to ask for a second title and we developed This Little Piggy which follows the same principle - the familiar rhyme is on the front page and to find out what each little piggy got up to, you have to lift the flap. 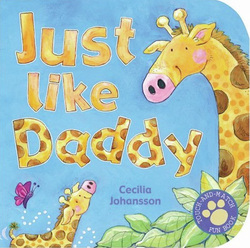 Rights: This series was produced exclusively for Lion Publishing. This story is beautifully fresh but also faithful to the Nativity so we felt that a religious publisher would really appreciate the nuance and subtlety of what we were trying to achieve. I presented the text and a sample illustration to Lion-Hudson at the Bologna Book Fair and was delighted when they decided not only to publish the story but to ask me to package the project. It was a wonderful opportunity to work with both Margaret and Karin again (we'd worked on a join project when I was Publisher at Zero to ten and that book was shortlisted for the Kate Greenaway medal). 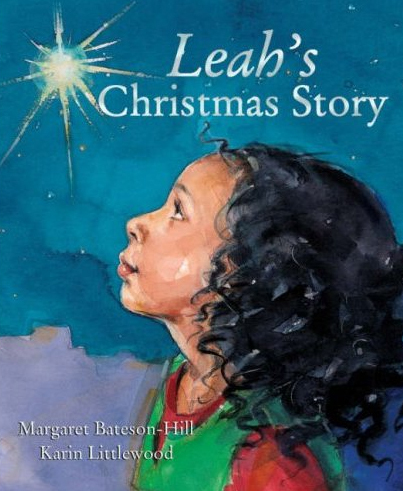 Leah's Story is the Nativity story told through the eyes of the Innkeeper’s daughter. Margaret’s ability to re-engage with well-known stories, whether fairy tales, historical work or well-known episodes from the bible is amazing - she can make something you thought you knew by rote seem fresh and interesting and make you think about it afresh... Leah's child-like wonder will make children (and adults) read the story like they were discovering it for the first time. More. Review: How hard it is to retell the Christmas story with freshness and immediacy! This picture book version of the tale manages to do both. Events are seen through the eyes of the innkeeper’s daughter, Leah, who helps Mary and Joseph find a place of shelter in her father’s stable. For Leah, whose mother died at her birth, the arrival of this new baby is already laden with meaning. Both author and illustrator present us with a very human young couple for whom the birth of their first child is both a real and a miraculous event. Karin Littlewood uses watercolour with tremendous skill and economy to convey the dramatic events of the night with all their emotional intensity. From 'Ten of the best Nativity Stories' Books for Keeps. I’ve been delighted to do various bits of writing over the past few years for Chorion and when I was approached to work up a concept and write the first story of a new Mermaid series for them I was very excited. Initially I worked with in-house editors to develop up the characters of the six mermaids and to come up with ideas which would help make their world magical. This work became the bible for the series. Then I wrote the first story. I've developed a number of projects for Little Tiger Press. They are fantastically creative in coming up with new novelty devices and my job was to think up editorial ideas, concepts and story lines which made best use of these innovative formats. There are lots of touch and feel books on the market and young children in particular love the tactile experience. However, in many of these books, especially flocked books, the tactile element has little editorial meaning. I set out here to embed some of the editorial concept in the fun of touching. The illustrator - Cecilia Johansson who is represented by Tall Bean. Rights: World rights are owned by Little Tiger. This series is published by Scholastic in the USA. Like Wanda’s Washing Machine, these little Mini Machines are books to inspire imaginative play. The little story is followed by a back page of press out pieces so young children can re-enact the story and then invent other scenarios. The stories are interconnected – Bill, Carl, Dan and Dave work to build a road and the pieces build to make a fun play set. The idea for these books came when I ran a Fairy Club in Acton Library in West London. I realised that, while there were many wonderful ‘fairy books’ for older children, there were very few for the very young. These four books follow four little fairy friends - one little fairy is the central character of each story, but all four friends appear in each. They have wonderfully simple adventures - and each time do their secret fairy dance. Each one is different and I hope little girls (and some little boys) will enjoy noticing their distinctive things each time. They all have a bubble blower - each in her individual shape - and I hope that little fairies might imitate them and do a fairy dance then perhaps try some of the other activities. Rights: World rights are owned by Little Tiger. This series is published by Little Simon in the USA.